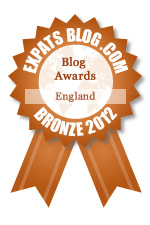 ExpatsBlog.com Expat Blog Awards 2012: England Bronze Award! This blog won the Bronze Award for best expat blog in England! Wonderful writing and inciteful anecdotes. I love this blog, there is never a boring post. It's refreshing to see my home country through the eyes of Vix. I love Vicki's blog. She writes so well and it's really interesting to see here take on life in the UK. Vix has a wonderful sense of humor and I frequently squirt coffee on my keyboard when reading her posts. As a Kiwi adrift in the rain soaked United Kingdom I do feel her pain and love reading about how she's trying to adapt to England's soggy climes. I love Vicki's take on things. She shares her experiences of life abroad in such a way that her readers are pulled in by her wit and personable style, as if we were tucked into her bag and taken along with her on her journey. Fantastic blog, with great variety and a funny outlook on life, makes me smile! I love this blog - travel advice, funny anecdotes, parenting tip, relationship help - Vix has something to say on every subject under the sun and always beautifully written with a great sense of humour. I enjoy reading vicki's posts, there's always a chuckle, a smile or something to make you stop and think. Brilliant blog, entertaining and always interesting, seeing the UK through an expats eyes. Vicki's blog is often the first thing I read when I wake up in the morning. Her humourous and insightful writing has made me cry, be uplifted, be inspired to do more in this world....and frequently made me laugh! A Kiwi that claims Vegemite?! Us Aussies might as well take the Finn brothers and Pavlova... Setting that aside great blog with a wide mix of topics and discussions. I enjoy catching up on Vegemite Vix when I do my blog reading.